Robin has made an appointment for me with a photographer to get an official "head shot." I think that term sounds about right as I'd rather be shot in the head then sit for a picture. I guess it's one of those things that I have to have...I get request for them all the time from bloggers, people running writing conferences, and those that interview me, and I just don't have anything good to provide. So, if nothing else I'll stop having to apologize each time I send one of my crappy self-portraits. My first "head shot" was literally done by me holding out the phone and taking a picture of myself. This was long before selfies were popular and I had to do it about 60 times as most of them didn't have me framed right (I wasn't looking into the camera for this. Of all of them I dislike this one the most. Especially since I don't look that way any more as the mustache was going very gray and making me look older than I actually was. My second "head shot" was from a picture that was taken at a restaurant in New York. I was actually sitting with my editor Devi Pillali, and it was blurry and dark - but that is probably why I liked it. The mustache was there, but hard to see. It wasn't high resolution though, so that took it out of the running for most of the requests. My third "head shot" was a picture from when I went to New York for The Audies award. I was in my new Tuxedo and sporting my $5 sun glasses - so I felt like Bond...James Bond. Again not the best picture, and certainly not how I walk around in day-to-day. But it was a great day and brings back some fond memories. So I'll soon have a new picture, I hope it is better than the other three - because it's being taken by a professional I suspect it will be. After all it, can't be worse. I've set a pretty low bar for him to jump over. 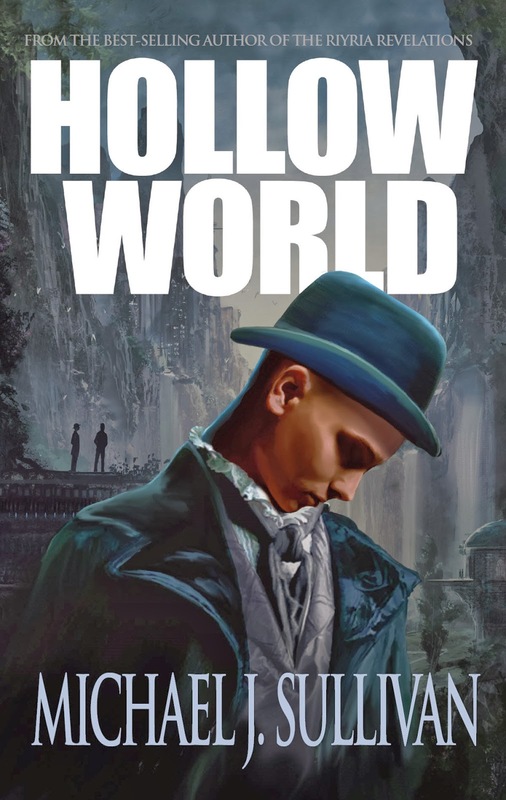 Well Hollow World's first day on sale (released early) has hit the books. And I just wanted to thank everyone of the amazing support. It's funny because hitting bestselling or top-rated lists would seem like something for me to take pride in, and I do, but the truth is a books success has more to do with the readers than with anything I do. It's people that recommend the book to their friends, leave reviews on Amazon and Goodreads, and buy as soon as the book comes out (a crucial time for any title) that make it a success. All I do is write a book that I want to read. For me, writing Hollow World was its own reward, and even if it never sold a single copy I would be happy because I love the way it turned out. But I do want to share what I write with others, and it's through the feedback from others that really motivates me on the writing front. There is one other aspect though...and something that many won't be aware of. Hollow World was an experiment in a number of ways. First there was the Kickstarter...an experiment for me, and I was floored by the response. Then there was the difficult decision to turn down a five-figure contract because they wanted print/ebook/audio rights. I opted instead for a much smaller advance for print rights and sold the audio rights myself. I REALLY want Tachyon Publications and Recorded Books to be successful with these titles because they represent publishers who are pushing the envelope and providing authors fair treatment and they need to be rewarded for their efforts. Provide a profanity-free version for those that object to explicit language. And I'm sure there will be many more innovations in the future that I don't want to miss out on because I don't own the rights. It's a great time to be a writer, so many innovations and opportunities to take advantage of. I'll keep writing and hopefully you'll keep reading. Thank you again. In addition to the Kindle version, the Nook version has gone live, but we are still waiting for ibookstore and Kobo, both of which are still in pre-order. Also keep in mind you can get copies from my site for 15% off. For print books, you can order from my site, Amazon, and Barnes and Noble. I don't think they are in the brick-and-mortar stores yet. For audio versions. The pre-order pages are up but the book won't be released until the official release date. It's snowing in Virgina - but April came early - Hollow World is shipping now! I always pre-order a copy of my books so I can see when they start going out to customers. Today I received my copy of Hollow World! I had purchased from Amazon, and sure enough the "pre-order" button is gone and the page now reads "in stock" and they can be bought. Same with the kindle version which is also live. Barnes and Noble's print edition is also live. I think the nook will be available shortly, as will the rest of the platforms. So we are getting them ahead of time. Can't wait to hear what people think. I've also seen that due to the Department of Justice settlement money is suddenly appearing in people's Amazon accounts for books they paid too much for pre-lawsuit. Hopefully some people will be using that to check out Hollow World. I'm not sure if the books are in the stores yet, I'll update you on that front once I know more. But for now here are some links for those that buy online. I want to thank everyone for all the amazing support for Hollow World pre-ordering. 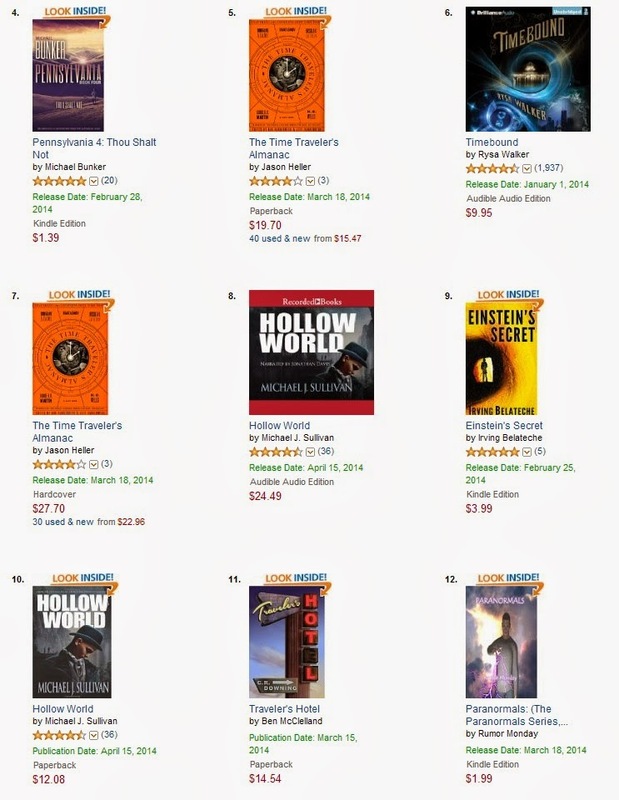 We are at 21 days and counting and the book is showing up in TWO spots on the Top 10 for the Hottest New Releases in Time Travel (#8 audio, #10 print) but also on the Bestselling Books in Time Travel. What makes that even more amazing is no the audio book isn't even available yet, so those rankings are just with the audio and ebooks. I'm so grateful for the support...and glad for the publishers (Tachyon Publications - print, Recorded Books audio) who are "doing publishing right" in leaving the ebook rights with the author, and making their money on the parts of book production they add the most value to. I also want to give an update on the Hollow World pre-order. For those who ordered the print book directly from my site, you already have your bookmarks and book plates, for everyone else, I hope to have them mailed in the next few days. Also, I've sent out the ebook and short stories to just about everyone...but the response was great, and I'm sorry I'm a bit behind. Part of the problem, is several of the short stories didn't have the various ebook formats created and Robin (who is doing the conversion) is working hard to get that done but she is also juggling several time-sensitive activities, so I ask you bear with us as we are working hard to get this to you just as soon as possible. Well that's it for the updates for now. Thanks once again for all the amazing support and I can't wait until the book is "officially out there" so I can see if you all love it as much as I do. Okay, I'll admit it. I like author interviews. It's always interesting to me to see how other navigated this crazy business of publishing and compare notes on how they write with my own techniques. I've done more than a few of them in the past...and while I always enjoy them, I think some are just much better than others. For some interviews, the questions are canned...the same ones asked over and over no matter who the author is. These are cool because when you read enough of them from the same site, you get to see the differences between various authors. But, they also don't allow for much personalization, and as such can feel a bit "phoned in." What prompted you to write Hollow World? What about the work is most interesting to you as the author? You have had a lot of success with theRiyria Revelations series. How difficult is it from a publishing standpoint to publish in a new genre? Have you surveyed a sampling of your readers to see if they would follow you into a new genre? Is there a focus on having those readers follow you into Hollow World or do you think you would be building largely a new audience? Even though the characters and genres are different, are there elements that readers of the Riyria series might find familiar in Hollow World? The way you are publishing Hollow World(which is to be released in April) is intriguing. You had noted on your website that you have sold the print and audio rights but retain the ebook rights to the book. How does that work? Are you then self-publishing the ebook version? What type of coordination is required between your own ebook release and the print and audio runs? I understand that last year you also conducted a Kickstarter (crowdsourcing) campaign for Hollow World? How does that fit into the overall publication process for the book? Do you think crowdsourcing campaigns (at least for novels) are more appropriate for established authors who already have some following than for new unknown authors? I suspect this might be different for art or picture books where readers can more easily decide whether or not they will like the art work. What observations can you make on the viability of the crowdsourcing model for novels? Given the changes that have occurred in publishing over the last few years, if you were still an unknown author who wants to publish a novel, where would you position yourself? Would you still pursue traditional publishing? Would you begin with self-publishing and see if you could find traction? Crowdsourcing? Some combination or hybrid path? What might be one or two important factors to consider? Riyria readers likely want to know more about where you are on the Riyria Chroniclesand I understand you are also working on a new fantasy series called Rhune. Can you tell us a little about your current projects and what readers can expect to see from you in the near future? So, if you are interested in any of these questions, my publishing history, or just want to see a really good format for interviews - stop on over...and leave Neil (the author) a note saying you appreciate his work. Bloggers run sites like this with little to no compensation and sometimes an "attaboy" can go a long way. I've had quite a few giveaways as of late, and this one is technically being run by Orbit, but it will probably be the last one for a while. There is about 14 hours left for The Crown Tower. And this will be for a signed copy. For those that aren't familiar with this book it is the first one in The Riyria Chronicles - a set of two prequels that take place at the forming of Riyria and since they are standalone, you don't have to have any prior knowledge of any of the other books to read it. Good luck and congratulations to the winner! We are coming down to the wire on the last giveaway for Hollow World, which will end in about 14 hours. Winners will not only receive signed print copies, but they will also get the ebooks in a variety of formats. 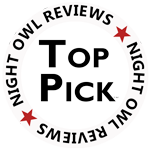 Early reviews have been coming in from those who doing the pre-order promotion, Net Galley Readers, and those in Amazon's Vine Program. Here's what a sampling. I hope you'll have a chance to enter before time runs out, and congratulations to the winners! 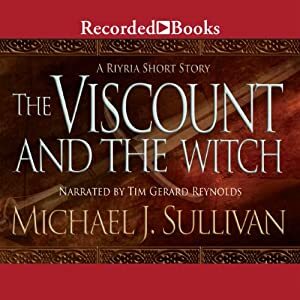 The Viscount and the Witch now available in audio - for free! That's all seven titles in the top 25! For those that aren't familiar, this was a short story that I wrote back in 2011 when my books were coming off the market and the Orbit books were not yet live. It's always been free and released originally to give existing fans a little something to hold them over while waiting for the last book. Since then, it' proved to be a good little introduction piece for those who have been considering the series, but have yet to take the leap. This book was also the seed that grew into The Riyria Chronicles (and in fact it is actually the second chapter in the second book of that series (The Rose and the Thorn). Even if you have read the book, I highly recommend you trying it in audio form. The narrator, Tim Gerard Reynolds, does an amazing job bringing the characters to life and really makes me sound good. I met Jon Sprunk a few years ago at Balticon back when he was still writing his Shadow Series. Then I scored a signed copy of Shadow’s Son at the Baltimore Book Festival and enjoyed it so much that Jon did the first, and I think only, guest blog on my site. Tomorrow marks the release of Jon’s first book in a new series. It’s called Blood and Iron. After the deaths of his wife and son from plague, Horace, a soldier from the west, joins the crusade against the eastern Akeshia. At the onset of the book, Horace’s ship, in route to the crusade, is destroyed in a magical storm at sea. When he washes ashore, he finds himself at the mercy of a people whose language and culture he doesn’t understand—the very people he was sent to kill. This is a departure from Jon’s previous anti-hero assassin-based novels into a little more positive adventure story that’s easy to like. 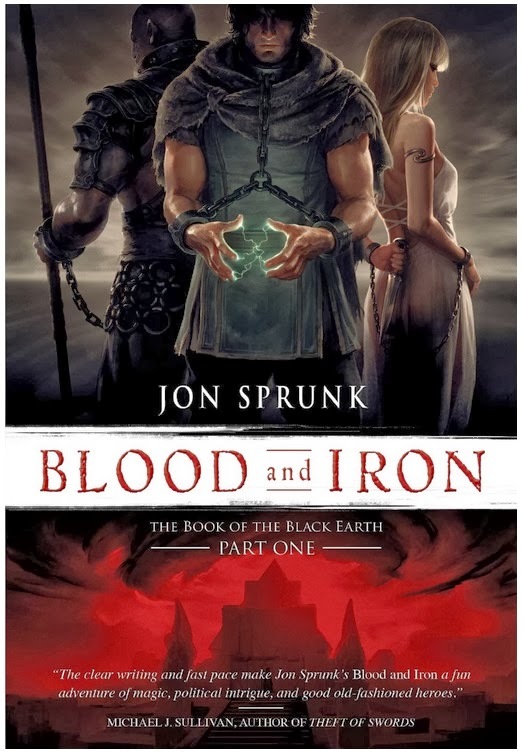 Jon is another fantasy author who prefers clear, easy to read prose, and stories that are not overwritten or overbuilt. Nothing stands between the reader, the characters, and their stories. Here’s hoping Jon has an easier time than Horace with his adventures in a new world. I'm not sure why, but right now there are two problems buying my books from Amazon. One of the nice things about Amazon is unlike a bookstore with limited shelf space the almost always have books in stock. I'm not sure why they're not keep up, I know there are books in the publisher's warehouses. 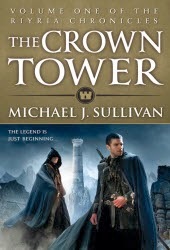 As for the discounting...on 3/9/2014 Amazon removed all discounts on my books (both print and ebook) except for the ebook of The Crown Tower which is discounted a whole $1 - woo hoo! Signed and/or dedicated if you wish. Also, I've received copies of Hollow World so if you want the book early - you can order it from my website you won't have to wait until April 15th. To order, just use the button below. 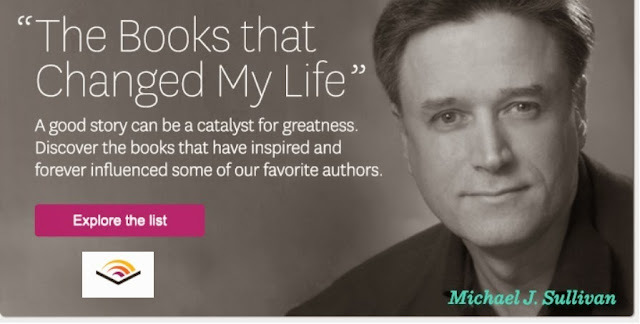 This is the header that precedes a pretty sizable section of a Forbes article written by David Vinjamuri about Author Branding, and the "Fantasy King" he was referring to was...wait for it...me! While I appreciate David elevating me to king status, I'm still very much a struggling mid-list author. But I think I have learned a thing or two about Goodreads, and I try to do what I can to help other authors learn how to get the word out about their books. 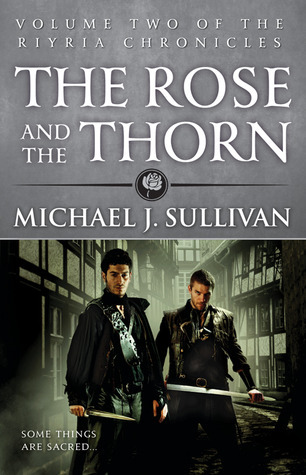 "When I asked Brown to cite one of the most effective authors on Goodreads, he named fantasy author Michael J. Sullivan without hesitation." Wow. I'm amazed that anyone in the author marketing department even knows I exist, let alone having the director think I'm a good example of how to effectively use this most excellent site. I've written a fair amount of advice on working with Goodreads, and now that I know that the people who run the site think I know a thing or two, it's time for a re-cap. So here goes. You have a lot of reading ahead of you, but I think it will be well worth you time. As I mentioned to David, I attribute Goodreads to a good 80% of my success. First, start by reading David's Forbe's article, The Strongest Brand in Publishing Is... David points out how important brand loyalty is for authors. He thinks it's even more important than platform and Bookscan data, and he shows how authors with good brand loyalty can command 66% higher book prices. The article gives a lot of good branding advice from David, Lee Child, Patrick Brown, and myself. Second, read an article I wrote for Amazing Stories Magazine: Marketing 101: Authors and Reading Communities. It explains how I interact at sites like Goodreads and /r/fantasy on reddit. Being an author on sites like these isn't easy. On one hand, you are a fan just like everyone else that is there, but those forums get so many writers whose only purpose is to push their books that they can be super-sensitive and downright suspicious about your intentions. Both this article, and David's emphasize my point about being a contributing member of the community first, and the fact that you are author as just something about you - not why you are there. As an aside, last year I won /r/fantasy's Stabby Community Achievement Award for Best Overall Redditor, so I must be doing something right on both sites. Third, I've written a series of posts on /r/reddit about being an author on Goodreads. The first one is, An author's guide to Goodreads. But it also has links in it to seven other posts covering everything from setting up your profile, how to introduce yourself, measuring your results, and how to put your best foot forward. I want to thank David, Patrick, and the members of /r/fantasy for their validation that what I do and how I do it is a good approach. As I stated at the beginning of this post, I'm just a struggling author, trying to find a way to keep doing what I love the most...writing books. I've tried a lot of things, some work, some don't, but if sharing my experiences can help authors live their own dreams and become full-time authors, well then I feel it was well worth the time to write up some of this stuff and share with others. I hope you find it useful. If you've been waiting for a good time to try out Theft of Swords, now might be that time. Orbit has lowered the price to $4.99 and since this volume contains two complete novels that is about $2.50 per book. I'm really pleased about the sale, and to be honest I have no idea how long it will last, so get it while you can. For books that have a hardcover release, there is generally a lower-cost mass market version that comes out six months to a year later, with the lower price for the book, the ebook prices comes down as well. Since Theft of Swords was only released as a trade paperback it has (with the exception of a few sales) been pretty much the same price since it was first released. To make matters worse, Orbit has stopped discounting most of the Riyria books (and a large number of Orbit's titles in general). I'm not sure why this is, but it makes the sale even more welcome as when not on sale the books run just a bit under $9.99. So, if you've not given the book a try, or have a friend you've wanted to start reading and they just haven't yet. Tell them about the sale and save them a few dollars. Hopefully the reduced price will find the series some new readers. And I thank everyone for helping to spread the word. Any success that the books have is more due to your support than anything I did. So I just wanted to let you know that I appreciate those efforts.